Enter to Win 2 FREE tickets to BamaJam, 2010! This is a 3-day/3-night music extravaganza on June 3-5, 2010. 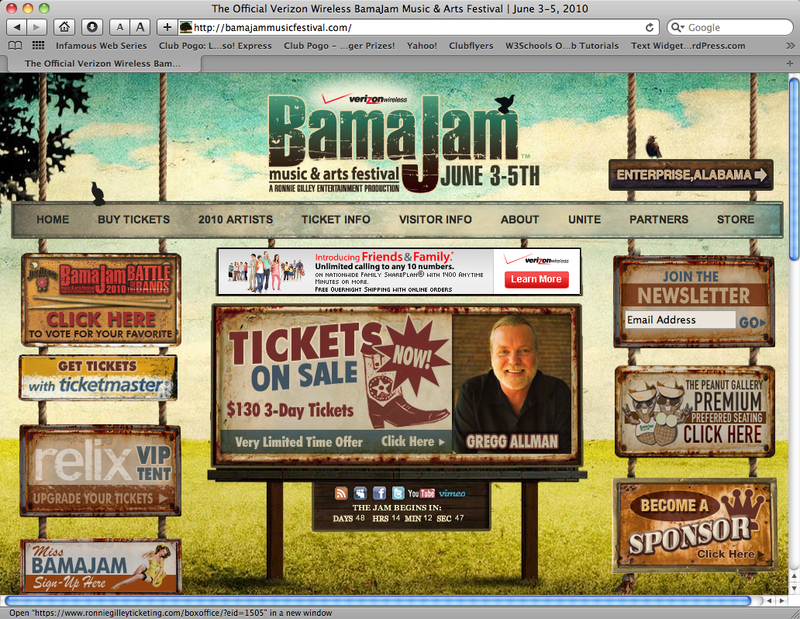 BamaJam is a Country Music festival that blends in Bluegrass and Alternative bands to provide diverse lineups. The 2010 lineup includes: Kenny Chesney, Hank Williams, Jr., Zac Brown Band, Gregg Allman, Dierks Bentley, Miranda Lambert, Disco Biscuits, Train, Travis Tritt, Citizen Cope, Buddy Guy, Gretchen Wilson, Danny Gokey, Rodney Atkins, Chris Young, Dirty Dozen Brass Band, Tyler Bryant, Alexa Carter, Locash Cowboys, Houston County, Colt Ford, Rio Grand, The Grascals, Randy Houser, Jamey Johnson, Robert Earl Keen, Matt Kennon, Stoney Larue, Lucero, Wayne Mills Band, Jake Owen, Blackberry Smoke, Marty Stuart & Fab. Superlatives, Jonathan Tyler & The Northern Lights, Edgar Winter and Led Zeppelin 2. In The Know will be giving away 2 FREE tickets for the entire 3-day show. We ask that you only enter if you are actually going to attend the event. Tickets are currently $120 each and will go up to $160 as this event is expected to sell out based on the lineup of artists performing. BamaJam tickets giveaway from In The Know only valid for Louisiana residents. ~ by Voltima on May 12, 2010.